E-bikes make cycling accessible for everyone. For people cycling of any age and ability, the small electric motor helps you get around town, carry your load, and get fresh air and exercise, too. Electric bikes remove excuses. There is no wind too strong, no hill to great, or no load too heavy to carry. E-bikes make the world smaller, communities stronger, and people healthier because you choose to ride more often. Come join the electric revolution and spend more of your days with a smile on your face! Don’t see the exact model you’re looking for from the brands we offer? We can bring them in by special order, too. Experience effortless cycling with the powerful and robust Bosch mid-motor. Due to the low position of the mid-engine, every Gazelle with a Bosch mid-motor has excellent maneuverability and handling. The robust Bosch mid-motor is ideal for both daily and long-distance trips. The 400 Wh battery gives up to 100 km on a single charge! The fashionable e-bike you want to be seen on is now even better. The mid drive Bosch Performance Line motor makes the GazelleNL even more stable and powerful. It means you outshine everyone: in town, up a hill or on the way to work. The NL is a workhorse for cargo, with its sizeable front rack, and perfectly balanced frame, it can help move you, your belongings, and your family with ease! The EasyFlow is like a good friend: always ready to help. You will feel secure and safe on the road on this all-rounder. Time to set off on another adventure together! With the lowest step-through height of any e-bike we’re aware of, this bike provides maximum accessibility for everyone. A stable, lightweight aluminum frame with balanced geometry keep you in a comfortable and upright riding position. The powerful Shimano Steps motor and the 504Wh battery provide a range of up to 125 kilometers. 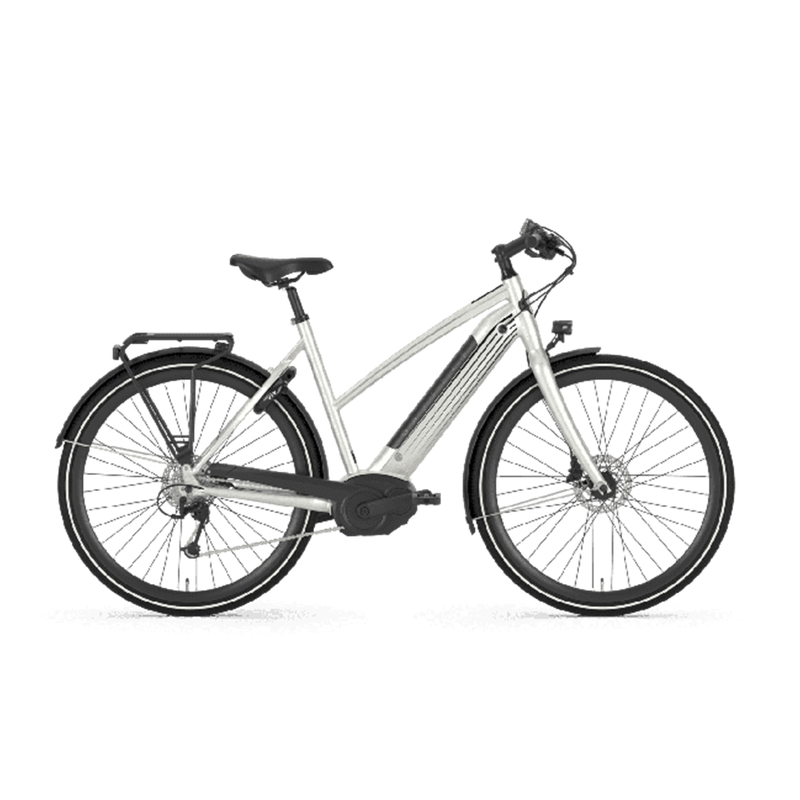 The low positioning of the motor gives every STEPS equipped Gazelle bike a lively and responsive feel. Reach your destination at lightning speed and with minimum effort, thanks to the powerful Bosch Performance Line mid-drive electric motor. The battery is nicely concealed in the frame giving the bike a tough and robust appearance. A lightweight mid step aluminum frame with sporty geometry put you in more aggressive riding position for precise and maneuverable cycling performance. The powerful and robust Bosch Performance Line motor with 60Nm of torque and 500Wh in-tube battery provides effortless 100-mile cycling range on flat to hilly terrain. Features like an AXA Blue Line 30 front light and AXA Defender ring lock offers high-quality integrated security with an innovative design. The Babboe Curve Mountain is based on the best-selling three wheeled "bakfiets" Curve but on steroids. Combining the awesome Yamaha 250w mid-drive electric assist motor and the step-less Nuvinci 330 gear hub you can get up to speed no matter how much weight you are carrying and then stop on a dime with the powerful hydraulic disc brakes. Do more on your bike with the Babboe Curve Mountain! The centre-piece of the Larry vs Harry lineup is the e-Bullitt 6000. Its seamless Shimano STePS motor makes worrying about the headwind, steep hills, and huge load a thing of the past. The Bullitt frame can carry up to two children, and tons of cargo (seriously, check out the Bullitt on Pinterest)! The box is fully customizable to your needs, and the bike rolls so smoothly you'll hardly notice you're on a cargo bike at all. Demonstration model available in-store, book your test ride today! From LBC owner Ben - I’ve been riding my e-Bullitt through the winter, and it’s been so capable that I’m selling my truck. Its four-season abilities, enormous cargo capacity, low floor for carrying passengers, and ease of use with the electric assist make it my favourite tool for getting around town! The Edgerunner is the ultimate cargo bike for your growing family. The swept back handlebars keep you upright while riding to your favourite cafe to read a book, or going with your kids to your the museum. The small 20” rear wheel lowers the center of gravity for greater stability, improves acceleration from a stop, and makes it easy to load up to three children or cargo weighing up to 250 lbs. The 100% Chromoly steel frame is the perfect material, because it’s lightweight, strong, and durable. The Bosch electric motor is powerful enough to flatten hills, and shorten distances to your destination. This bike is built to grow with you for life. New 2017 “Swoop” frame design is recommended for all users. Realize your dreams. Sweeten your days. One pedal stroke at a time.